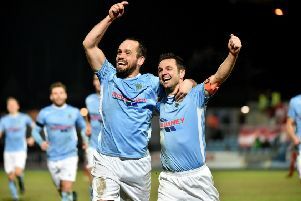 Ross Redman (left) celebrates with Ken Oman during last month's win against Carrick Rangers - a result that stopped the rot after six successive defeats. Pic by PressEye Ltd.
For a full-back so often associated with an attacking contribution, it may come as little surprise to hear Ross Redman praise the importance of forward momentum. Redman’s growing role in team affairs this season has coincided with an upturn in fortunes for a Ports side that slumped to six successive defeats during the horror show across October and November. Two set-piece assists from Redman led to Ken Oman completing a thrilling fightback against Carrick Rangers last month that stopped the rot thanks to a 3-2 victory with 10 men from 2-0 down. A draw on the road at Ballymena United preceded a 2-0 victory at Shamrock Park against Linfield - with Redman clearing one attempt off the line then creating a chance for Chris Casement to break the deadlock within a matter of seconds. That three-game unbeaten run has helped to repair confidence within the Ports ranks and improved a league position which could gain another significant boost with victory this weekend against Glentoran. “We have been under-performing this season but still think Europe is a realistic target,” said Redman. “We want to go out now and prove the ability. “The Carrick win was a real turning point and the crowd really got behind us that day, then again in the Linfield win. Redman, who made his debut across the 2006/07 season, can reflect on a string of memorable tussles with Glentoran. “Thankfully things have calmed down off the pitch between the fans but there is still that same intensity between the players,” said Redman. “Extra motivation will not be an issue. “From a personal viewpoint, I am also starting to feel more confident and it has been a tough battle back up to speed from the cruciate ligament injury. “That is now about 18 months, which is what I was told as a timeline for things to return to normal.